But different from any stew you’ve probably tasted before. East meets west in a delicious jumble of cultures. I actually don’t think there’s anything like this served in Korea. Not that I could find. It’s a bit of fusion I guess. Beef stew technique from the west. Deeply browned beef. A bit of liquid. Braised. But there’s a miso soy marinade. And dashi instead of beef stock. That’s Japanese. 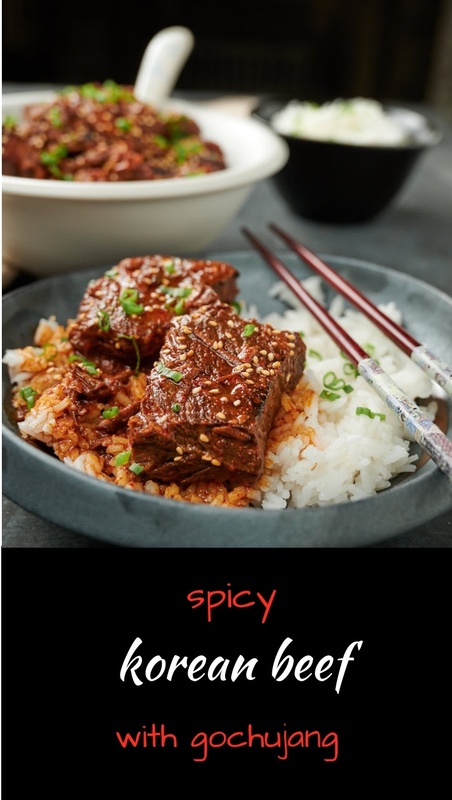 Then there’s a bit of umami goodness and bite from the gochujang. And some gochugaru for good measure. The hit your head over the head flavours are all Korean. But they fit in perfectly. 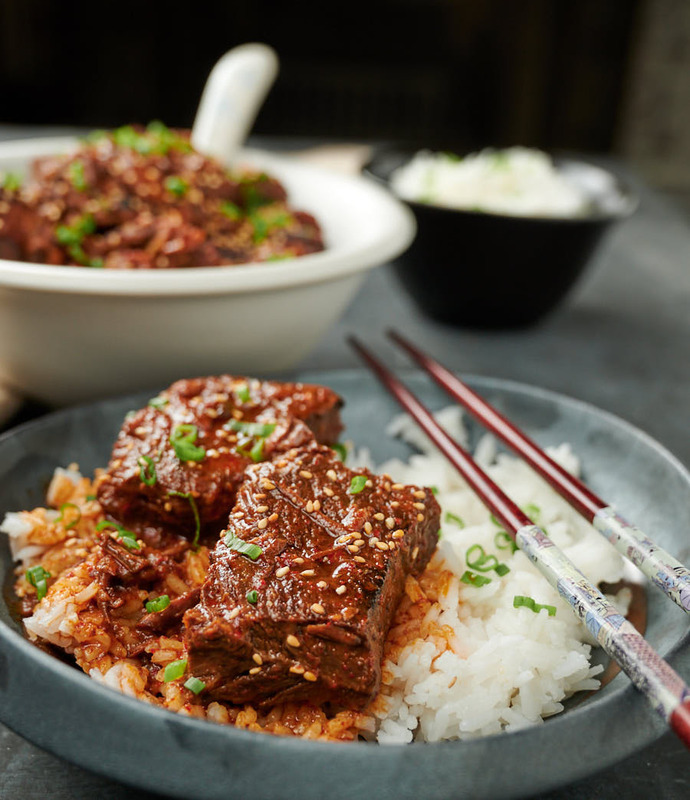 This Korean beef stew is started as a riff on a Japanese short rib recipe. But it got jacked up with big Korean flavours along the way. So way closer to Korean in the end. You can call it what you like. It’s not authentic. Not some time honoured family recipe. Comes from a combination of what I saw on a cooking show and dreamed up myself because I like spicy. And Korean. I say Korean. You may say Korean inspired. Or Japanese with Korean flavours. Or crazy. Up to you. Bu just make this and decide for yourself. You won’t be disappointed. 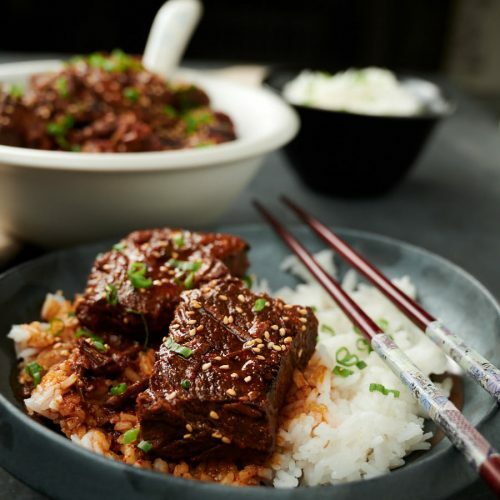 I saw this awesome sounding Japanese miso braised short rib recipe on a show. It sounded so good. Then I started to work with it. It wasn’t so good. Flawed even. Way too salty. And they had mirin and brown sugar in the marinade. I should have known better. Sugar plus beef plus heat makes for a big burned mess in the bottom of your pot. I tried it. I scrubbed that pot for a long, long time. But I liked the concept. So I started tinkering. And Korean beef stew is where I wound up. No mirin and no brown sugar here. For those I told I would figure out the miso soy braised short ribs on Salt Fat Acid Heat. I tried. I failed. Short ribs are really good. I love them. But they aren’t always that easy to find. Or to get the size you want. It’s really butcher territory. And even then it can be hit or miss. So I make this with beef chuck. A beef chuck roast to be specific. And I cut the roast up into great big chunks. So you get the same long braise you would with short ribs. Less fat in chuck though. So not quite the same. But still good. Really good. No matter what beef cut you choose browning it well is key. Take your time. You want each piece to get evenly coloured. This is all about building flavour. And flavour starts here. Using dashi instead of beef stock is pure Salt Fat Acid Heat. And it’s a great idea. 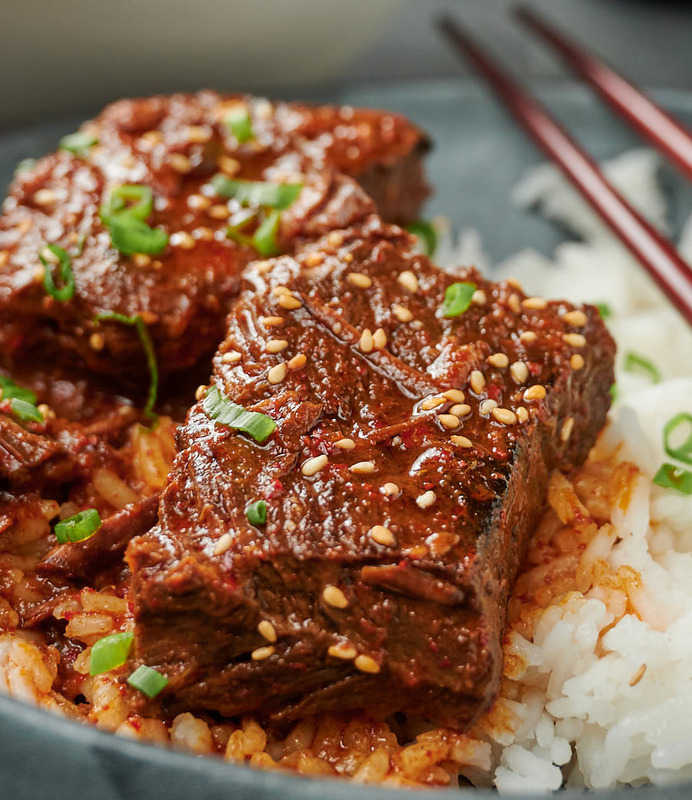 Something about the hint of ocean makes this the Korean beef stew come together. It doesn’t taste fishy though. So don’t be worried about that. It’s like slipping an anchovy into lamb stew. You can’t put your finger on it but it’s special. Same idea exactly. 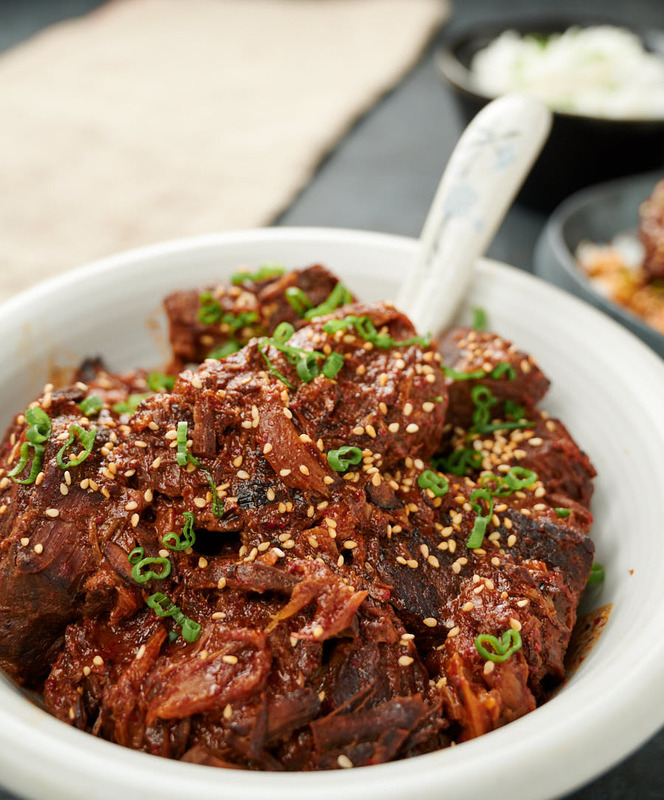 Korean beef stew is spicy, complex and delicious. Try it with rice or kimchi mashed potatoes. Combine miso and soy in a small bowl. Stir to combine thoroughly. Mix the miso mixture with the beef and refrigerate 4 to 12 hours. Film a pot generously with vegetable oil. Brown the beef in batches over medium low heat. Leave room around the beef. You don't want it to steam. You want it brown. Take your time. Every stove is different. You may need to adjust the heat. Do what works for you. Transfer the browned beef to a clean dutch oven. Add the garlic and the gochugaru to the pot. Make your dashi. Bring the hon-dashi and water to a boil. Let simmer briefly. 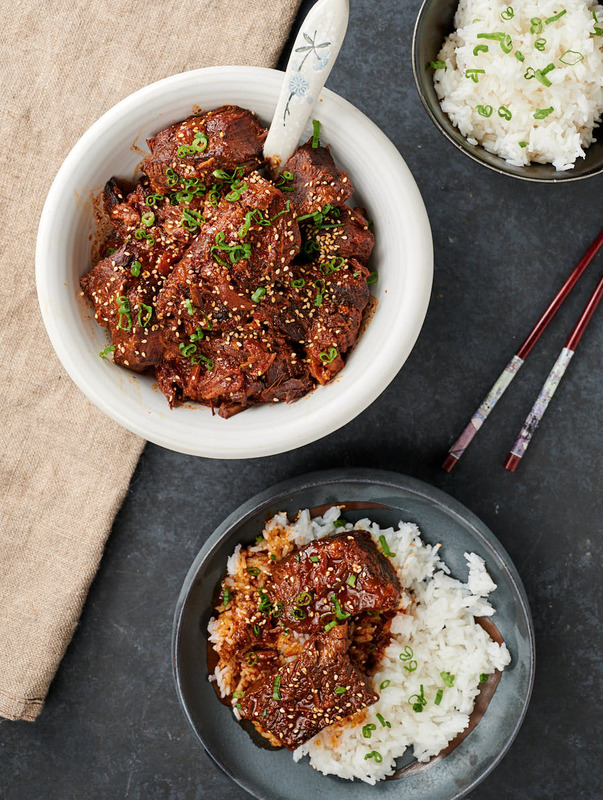 Mix the gochujang with a couple tablespoons of hot dashi in a small bowl. Add a bit more dashi if needed. Get the gochujang to dissolve in the dashi. It's way easier to do this in a small bowl. Chasing miso or gochujang around a large pot is a pain. Add the gochujang mixture. Now add enough of the remaining dashi to come up 2/3 of the way up the meat. Cover the dutch oven with aluminum foil or parchment. Then put the lid on it. Place in the oven and braise for about an hour. After an hour give it a stir and return it to the oven. 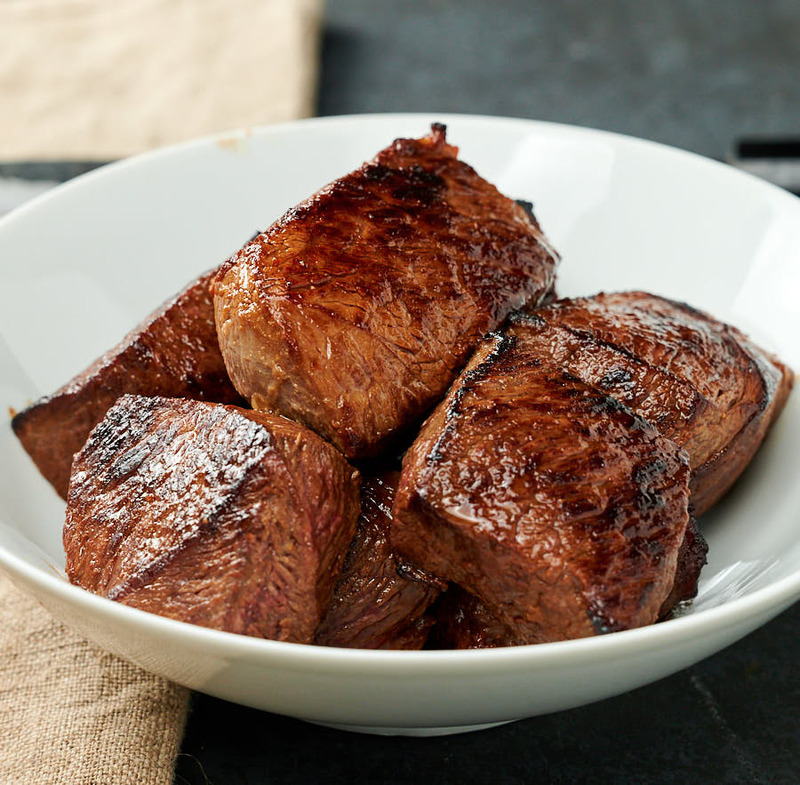 Beef is done when it is tender. This will take probably around 3 to 3 1/2 hours if you have big chunks. Start checking after 2 1/2 hours. There's no way to rush this. It's ready when it's ready. 3 cups of water and 1 tsp hon-dashi makes a pretty mild dashi stock. If you make your own from scratch then substitute 2 cups dashi and 1 cup water. In beef, korean, main course. Bookmark the permalink.